What to do if your kids hate stew? I don’t know why, but my kids don’t like stew. 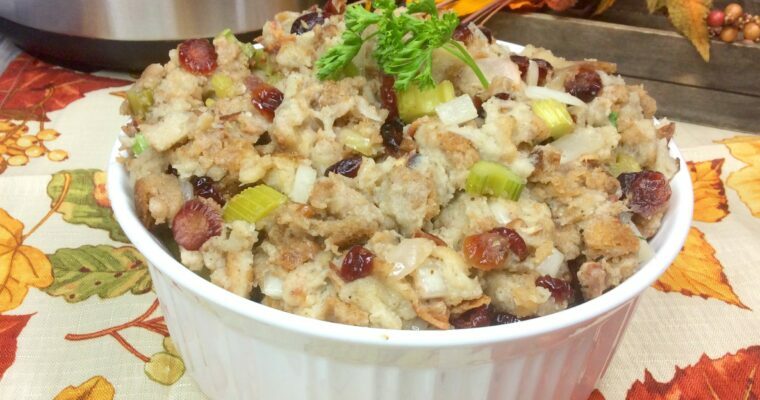 They love gravy, potatoes, carrots… seems like it would be a slam dunk. Not so. They don’t like beef that’s been cooked low and slow. Not in a stew, not as shredded beef for enchiladas or tacos, I don’t get it. What I do know, is they will eat this Meatball Stew! 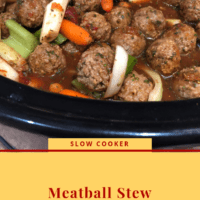 It’s got all the flavour of stew, but it uses meatballs which they also love… kind of brilliant! and it’s faster than regular stew too. 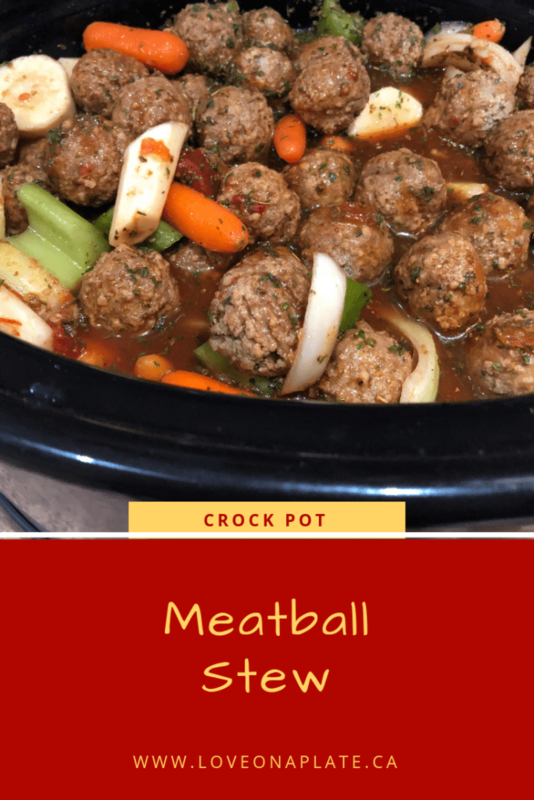 What to serve with Meatball Stew? Honestly a big bowl of delicious stew can be dinner all on it’s own. At our house, if I haven’t put potatoes in the stew, making a big pot of mashed potatoes in the Instant Pot is always popular. I also serve it with a side salad with Italian Vinaigrette dressing and warm french bread to soak up all that delicious gravy! I LOVE gravy. Want to see how easy this is to prepare? I LIVE streamed the prep over on the Love on a Plate Facebook Community Group. Join us. 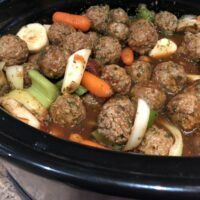 Combine meatballs, celery, carrots, red onion, potatoes, salt, pepper, garlic, parsley, oregano, Worcestershire sauce, beef broth, and tomato sauce in the crock pot. I used a 6 qt Crockpot for this stew. Cook on HIGH for 4-5 hours or LOW for 7-8hrs. Great for a work day dinner as it will be fine sitting on warm until you get home. About 30 minutes before serving, add in your frozen peas. Continue cooking covered for 30 minutes. 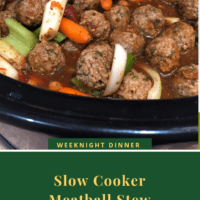 This dish Meatball Stew can also be made in the Instant Pot with very few adjustments. Place all ingredients into the Instant Pot and set to High Pressure for 6 minutes. Once time is up, do a quick release and open the pot. Set the Instant Pot to saute and add 2 Tbsp cornstarch slurry. Let simmer over medium heat until gravy thickens to desired consistency.